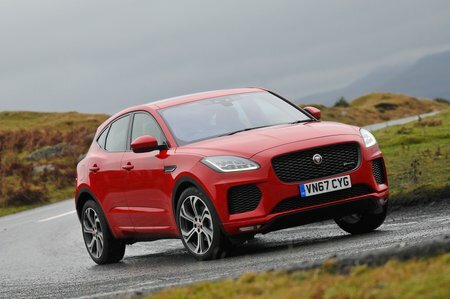 What's the used Jaguar E-Pace estate like? SUVs. You can’t walk down the street without tripping over one. Even premium manufacturers are falling over themselves to launch new ones, and, though late to the club, Jaguar has already given the world the sizeable F-Pace, the all-electric i-Pace, and this, the baby of the range, the E-Pace. If success were defined by sales figures, the E-Pace is already a smash, and it’ll certainly introduce a lot of new customers to the brand. Style-wise, it looks enticing, provided you don’t mind your cars short and tall. The ovoid headlights, wrap-around taillights and butch haunches all offer a glimpse of that proper Jaguar look - like a large and powerful cat about to pounce. It’s based on proven Land Rover underpinnings, notably the Evoque and the Discovery Sport, but such providence means it weighs heavy, heavier even than the larger and more opulent F-Pace. Under its bonnet is a range of three 2.0-litre petrol engines in varying states of tune and three diesel units likewise in three different power outputs. Petrols encompass 198bhp, 245bhp and 295bhp versions, and the diesel 2.0-litre units can be had in 147bhp, 177bhp and 236bhp trims. New buyers would have been offered the choice of two initial trim levels, the standard car or the sportier styled R-Dynamic version. The latter gets you a more aggressive bodykit, satin chrome side vents, a gloss-black grille and twin tailpipes. After that, you’d have to decide how much equipment you wanted. All versions come with dual-zone climate control, cruise control, front and rear parking sensors and LED headlights, but S trim adds leather seats (electrically adjustable in the front) and a more sophisticated infotainment system. The pricier SE and HSE trim packs add bigger wheels, more electric seat adjustment and increasingly more safety kit. On the road, the lower powered petrol and diesel engines feel slow to respond, even if their actual on-paper turn of speed is pretty good. The automatic gearbox is often hesitant in its responses, which can be problematical on roundabouts and at junctions, but once on the move it changes gear smoothly. Opt for the more powerful units and gathering speed is no problem, but there is an obvious drop-off in fuel economy. The middle-ranking 178bhp diesel, the 2.0d 180, probably strikes the best compromise between outright punch and efficiency. The ride is a mixed bag. The E-Pace isn’t horrendously firm and only crashes over the worst potholes, but you are jostled around quite a bit along pockmarked and beaten-up urban roads. The ride doesn’t settle out on the open road, either; even on the motorway, things are far less settled than in a Volvo XC40, for example. Adaptive dampers were available as an option and that improves things. Smaller wheels are likely to do so, too, but this does reduce the obvious visual appeal of this sporty Jag. From new, the E-Pace was available with front-wheel drive or four-wheel drive. Most versions come with the all-wheel-drive option that predictably offers plenty of grip, although the entry-level diesel engine came only with front-wheel drive. In that guise, the E-Pace’s handling isn’t quite so assured; the steering wheel squirms under your hands if you accelerate eagerly through corners – something that you don’t find in the four-wheel-drive versions. That said, it is only in quick corners, or in bad weather, that you really feel the benefit of the four-wheel drive system. Inside is a clean and handsome layout with some good-quality plastics and materials and a set-up that’s surprisingly user-friendly. The dials for the air conditioning are a doddle to use and you sit suitably high up, whereas in rivals such as the Audi Q3 and BMW X1 you could almost be sitting behind the wheel of a regular hatchback. Having said that, visibility to the sides is a little restricted by the fat pillars, and to the rear by the high and small rear window. Better still, on all but the entry-level trim, you get electrically adjustable front seats that make it super-easy to fine-tune your driving position. 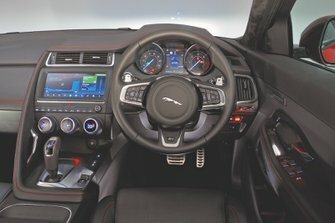 All versions of the E-Pace come with a 10.0in touchscreen infotainment system that Jaguar calls Touch Pro. It’s relatively snappy to respond when you prod it, the graphics are sharp and the interface reasonably easy to get your head around. Mind you, some of the icons are small so can be a bit tricky to hit with any degree of confidence on the move. Space up front is good, with a reasonably good amount of head room, but rear seat passengers long of leg will find it cramped behind a similarly tall driver. The rear seats fold down to leave an almost flat floor, while the boot is easy to access and usefully shaped, and has a good carrying capacity on paper. However, one or two rivals are able to carry slightly more luggage.